This is a great bar piece. 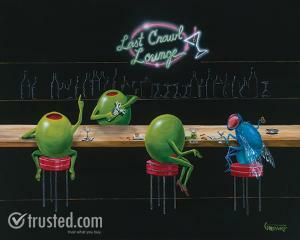 Here is scene at the Last Crawl Lounge. The bar fly is hanging out picking up chicks. The detail of the silhouettes of the bottles in the background makes this a well dimensioned piece. I had a difficult time painting the fly... it was almost impossible to keep still!